Broccoli Bread is a healthy low carb bread substitute. It contains no gluten, grains or sugar only goodness to help you eat a radiant natural diet. 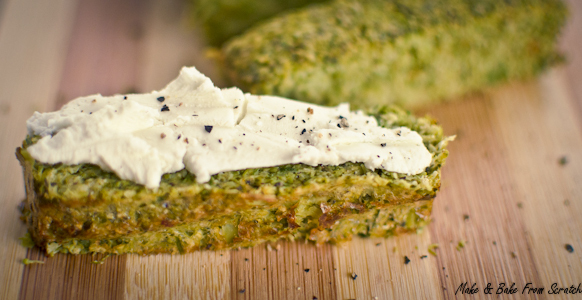 Eating Broccoli Bread is a fantastic way to increase your vegetable intake. Broccoli contains vitamin C, K and A, manganese, potassium and glucosinolates. Broccoli requires a fat to be consumed alongside it to maximize the absorption of the glucosinolates, vitamin A and K. I used eggs and full fat Greek yogurt in the recipe to boost absorption. Broccoli Bread has a high fibre content from the coconut flour and psyllium husks. You can add your own flavours too, I added fresh chives. It tasted delicious with goats cheese on top. Pop chopped broccoli and chives in the food processor, pulse until they resemble a rice texture. Add to a large mixing bowl and add psyllium husks, coconut flour, salt, yogurt and eggs. Stir until the mixture is combined. Scoop into your silicone bread pan or a round pan and bake in the oven for 30 minutes, it should be golden brown and firm in the middle. Allow to cool and serve with some roasted cherry tomatoes and goats cheese. Looks fantastic – I must try it when I get back off holiday. One question : can you freeze it? Some Christmas Day guests are gluten-free.